It’s been a while since I’ve posted anything. But, this is worth the time. I’ve read about VST Precision Filter Baskets before and finally decided to see what this was all about. I just picked up the 18gr VST STD Ridged filter basket and the difference it makes is crazy. 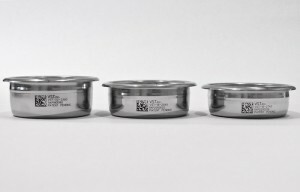 You can read all about the fancy holes and quality control elements of the VST Precision Filter Baskets on their site. But, the main take away is that it’s not just a marketing gimmic. The design of the VST baskets is superior to most stock filter baskets and the result is sweeter, better tasting espresso. The main thing I notice instantly is that the side walls of the basket are not really tapered at all (like my stock Bezzera or Gaggia baskets). There is a small curve near the bottom, but mostly, they look nearly straight by comparison. This means that the coffee puck is a uniform depth all the way around. This matters because even before you get to the precision holes at the bottom, the coffee is uniform leading to even saturation. Now, this design also has the side effect of showing even the slightest error in your distribution and tamping technique. So, be prepared to reset what you think you know how to do a little. Also, I had to actually adjust my grind finer to deal get the same timing with my standard 18.5gr dose. The result in the cup is a sweeter, more complex espresso. Same beans, same grinder, same machine…just changing the filter basket made the espresso taste significantly better. If you are serious about your espresso, it’s well worth the $30 for the VST basket. FOOTNOTE: For most home machines, you probably want the STD Ridged model. This “ridge” is a small bump on the outside that catches the “spring” in the portafilter and locks the basket in. The “ridgeless” models don’t lock like that…they rely on simple friction fit. If you DO NOT have a bottomless portafilter, you might need to get one if you get the 18gr or larger basket. They have the dimensions on their site so you can measure your gear for compatibility. Weiss, Stockfleth, Finger Strike…aliens? After dosing, espresso distribution in the portafilter is the biggest thing that affects your shot. So, what’s the best way to do it? Let’s test some methods and find out. Looking for a quick grinder comparison? Here’s all three grinders I compared using the Gaggia Classic. So far, we’ve had a budget grinder (Capresso Infinty), and a good grinder (Macap M2M). What about something in between? Here we have the Baratza Preciso. This is a workhorse of a grinder that is easy to maintain, and I’ve had this one now for close to 4 years. You really can’t go wrong with this grinder in your home set up. Paired with the Gaggia Classic, you will be very happy with your home espresso. Does the grinder really matter? Really? Just how much does the grinder affect your final product? And, does it really matter if you have a decent one or not? I have been fortunate to be able to actually test this. I have both a Macap M2M and a Baratza Preciso. The Macap has flat ceramic burs and the Baratza uses conical steel. Both are really excellent grinders with the Macap about $100 more than the Baratza. I ran the same beans through both and dialed in an 18gr dose for my preferred 45sec run time to 40ml on a Gaggia Classic. By all accounts, the Macap shots are excellent…really good, But, the Baratza produced a significantly sweeter shot…like a WTF…did I use the right beans type of significance. But, it doesn’t end there. I was able to pair these same two grinders with my other espresso machine, a Bezzera BZ10. I dialed in the exact same shot. 18gr, 45sec, 40ml. The Macap pairs with that machine way better than the Baratza did. The Baratza shots were always a little bit flat…really good, but lacking a little “pop”. With the Macap, the shots all of the sudden popped like I wanted them too. I had a hunch that changing the OPV setting on the Bezzera would make it even better, and I was right (adjusted the OPV down to 9.5 bar). So, there you go. Yes, the grinder matters, and simply changing your grinder can improve your cup even if you use the exact same machine and beans. I did a video with the Gaggia Classic and a budget grinder to prove you could get a really nice shot with a setup that you could get out the door with at about $500. So, now, here’s the reason you always hear people talk about the grinder, grinder grinder, when giving advice on making better espresso at home. Here’s a shot with the Gaggia Classic and a good grinder, the Macap M2M. This setup is closer to $1000 out the door new (machine and grinder). Note that I did use a slightly different technique here and different beans, but that really made little difference to the overall outcome. In the budget shot, I used a single origin, natural process Sumatra bean…which produces great crema. In this shot I used a blend, but plain and simple, the better grinder yields a better shot. I just got a new grinder and boy am I happy. 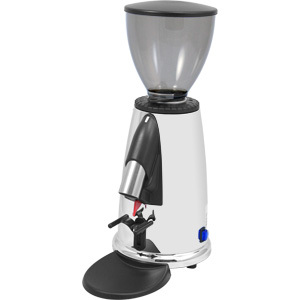 It is the Macap M2M Espresso Grinder. I picked it up at 1st Line. This is labeled as a “commercial” grinder. And I can see that working in a small cafe. But, it’s not fast enough to work in a really high volume shop. However, the Macap M2M is built like a tank, and the small footprint is excellent for home application. You can read my full review here.